In New Warriors vol. 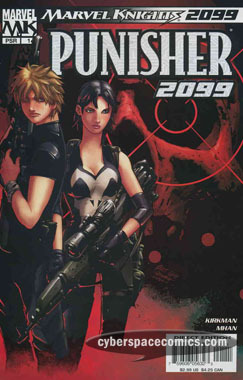 II #10 (cover date: July 2000), the creative team, of Jay Faerber (writer) and Jamal Igle (artist), shows up as Hollywood producers/directors that are interested in working on Nova & Speedball’s script. What If vol. 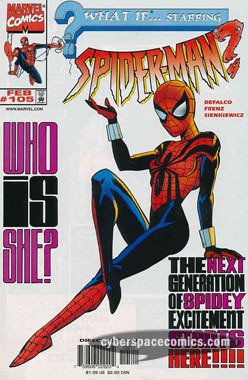 II #105 introduced Spider-Girl (and a host of other characters), who went on to star in her own solo title for 100 issues! That title was canceled to make room for her second ongoing title, the Amazing Spider-Girl. 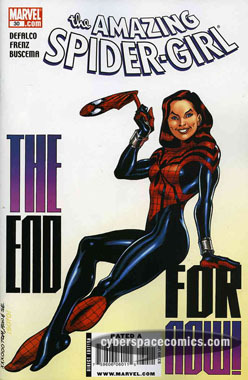 Her second series ended with issue #30 and was followed by the Spectacular Spider-Girl, a four issue mini-series. 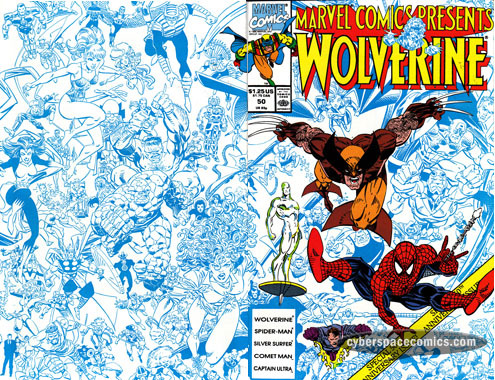 Spider-Man and Wolverine recuperated from last issue’s blast and resume their battle against Critical Mass and his Band of Baddies. In the battle, Spidey discovers that the guy dressed as a burglar is his dentist! The kidnapped girl uses her blasting powers to take down the warehouse and when Spider-Man comes to, everyone else is gone without a trace. After discovering two of these villains are related to him somehow, and with the knowledge of other friends-turned-villains (like the Green Goblin), Spider-Man can’t help but wonder if his presence is somehow coincidentally turning people in his social circle into villains. Comet Man is aboard a Fortisquian Starcruiser orbiting Earth’s moon, searching for the man who ruined his life, the Superior – his own brother. A teleconference with Reed Richards confirms that there is no trace of his brother to be found. After the call, Comet Man’s mentor, Max, decides it’s time to take a break from training and return to Earth. Max intends to enjoy Earth culture as Comet Man tracks down his son. And, as Comet Man returns to his family’s neighborhood, he stops a drunk-driver from hitting a biker. Doc Samson cures Captain Ultra of his pyrophobia and he goes on a joyride through Poughkeepsie, unintentionally destroying some parts of the city. A friendly cop convinces Captain Ultra that any real super-hero belongs in New York City. So, moving to a new city, Griffin Gogol (Cap’s alter ego) decides to pursue a career as a stand-up comedian. Too bad the club he’s performing at is being frequented by Ekl’r – the Demon Without Humor. Looks like this is a job for … Captain Ultra! And, using his Ultra-Potential, he can do anything better than anyone else – so he destroys the demon with an Ultra-Joke. Flying through space, the Silver Sufer combines with a singularity (a black hole) and crash lands on a small planetoid that orbits the black hole. He’s revived by a young woman named Rava and she explains that her people are prisoners of the Marauder – the conqueror who controls the singularity. Can the Silver Surfer defeat such a powerful villain now that his board has gone missing? 1. He says “Holey Moley”. 2. He reveals that he’s an orphan. 3. Wolverine refers to him as “Captain” and “Mr. Beck”. Fawcett Comics’ Captain Marvel was co-created by C.C. Beck whose catchphrase was “Holey Moley”. Additionally, his alter ego was an orphan named Billy Batson. Soooooooooo this is an unauthorized guest-appearance by Captain Marvel (who, at this point, was owned DC Comics). Now, as fun as the art was in this three-parter, the storyline wasn’t all that great – aside from asking a question that we’ve always wondered about. Naturally, no answer is provided. It’s neat to see Marvel following up on a minor character with this Comet Man feature. He had his own mini series in the 1980s and later appeared in a few Fantastic Four issues. Even better? It utilizes the same creative team as his mini-series (the writer is Bill Mumy; Will Robinson from Lost in Space). Another one of Marvel’s minor characters is featured in this very issue: Captain Ultra. This character was also featured in the Fantastic Four, years ago – and is brought back here by writer, Scott Lobdell who also has performed as a stand-up comedian (just like Captain Ultra’s alter ego). And, how about that Larsen cover? Supposedly, it features every character that has appeared in MCP so far. And – it must have taken him days to put together! Robert Rodi is a novelist who’s also worked on comics like Loki, Rogue and his creator-owned title Codename: Knockout. 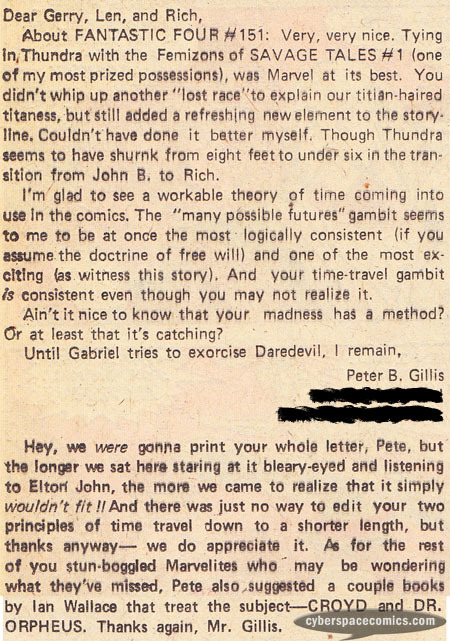 Ge got a letter printed in Fantastic Four #155 (cover date – February 1975), applauding tying Thundra’s history into previously established work in Savage Tales. 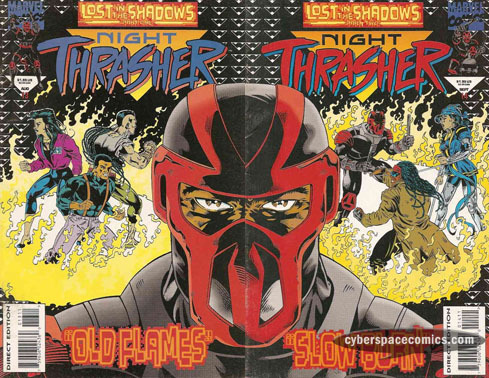 In this two-part storyline, Night Thrasher decided to do business with an old villain-gone-legit named Scorch. But, his ex-girlfriend, Silhouette, and half-brother, Bandit, weren’t too happy about the decision. 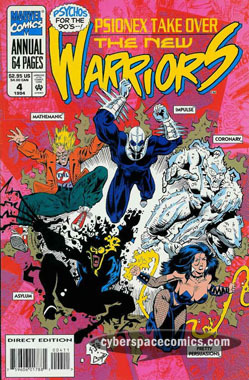 The New Warriors were a group of teen-heroes for the 1990s that was a ton of fun with great writing by Fabian Nicieza and art by Mark Bagley. 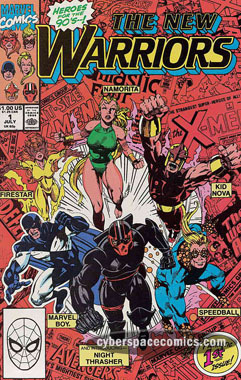 The team was made up of Nova, Namorita, Speedball, Marvel Boy, Firestar and Night Thrasher. Psionex was a group of villains they faced off against and, in Annual #4, they decided to go straight and be a new team of super-heroes. 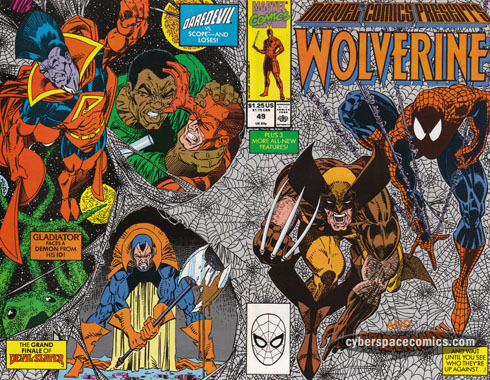 Spider-Man and Wolverine find the kidnapped girl and take on her captors: Critical Mass and his Baddies (Whiplash, Bloodlust, the Savage Fin and an unnamed burglar). And, as our heroes start to win the day, the mutants make the little girl user her (previously unrevealed) powers to stop Spidey & Logan. Devil-Slayer is met in battle with the triple threat of the Flying Dutchman, Colonel McCloskey and Colonel Ramirez. The Dutchman opens an abyss that serves as the entrance to Mephisto’s realm – and, in their fight, Colonel Ramirez plunches into it, head-first. Colonel McCloskey almost meets the same fate but, he manages to cling to the edge with one hand. Before he can fall, Devil-Slayer defeats the Dutchman with a bottle full of Holy Water and then saves McCloskey’s life. The Flying Dutchman is wounded and retreats, leaving Devil-Slayer with his soul still intact. Eric Simon Payne then decides that he’s been granted a second chance at life and will give up being the Devil-Slayer. In his latest attempt to bust up a drug-deal, Daredevil comes face to face with the villain named Scope. He’s got hyper-sensitive senses, too … but he’s not blind! How’s Daredevil going to get himself out of this one? Gladiator has sworn to serve she who sits upon the Shi’ar Empire’s throne. Currently, the ruler is Deathbird who has taken the throne from her sister by force. And, even though he is not happy about it, Gladiator continues to uphold his vow of service. Torn by his actions, he flies to Sector 9511 of the Shi’ar Galaxy to blow off some steam by flying through stars and destroying the landscapes of dead planets. On one of these planets he’s attacked by a Devonian Xontar – a foe whose powers are fed by its enemy. The more you struggle, the stronger it becomes. It takes a while – but, eventually, Gladiator realizes that the only way to beat this foe is to give up and stop struggling. And, by surrendering his rage, the attack has ended. He is free to pursue loftier goals – as is his heart. Well, this is an MCP first! It’s the second consecutive cover done by the same artist. This “award” goes to Erik Larsen, who’s also the writer and artist on the Spider-Man/Wolverine feature. His story seems to include some strange coincidences. It takes place in the abandoned warehouse where Spider-Man first tracked down his Uncle Ben’s killer. Spider-Man recognizes the villain, Critical Mass, as a kid from his fourth grade class. And, the unnamed burglar bears a striking resemblance to the one who killed Uncle Ben (but, didn’t he die in Amazing Spider-Man #200?). Topping it off, there’s also the debut of the Savage Fin who looks very similar to Larsen’s creator-owned Savage Dragon (his title hit stands two years later). Zimmerman’s Devil-Slayer feature is intended to be a true ending to the saga of the Slayer – this is certainly not how I thought this tale would end but it’s neat to see our hero at peace with himself. Will it last? The Daredevil solo was pretty bland but Gladiator’s was a great feature of his abilities and also added some interesting character moments as his great rage was quelled. Total Number of Copies Printed (net press run). Avernage number of copies each issue during preceding 12 months. 281,765. Single issue nearest to filing date: 245,225. Paid Circulation: 1) Sales through dealers and carriers, street vendors and counter sales: Average number of copies each issue during preceding 12 months: 163,295. Single issue nearest to filing date: 132,100. 2) Mail subscriptions: Average number of copies each issue during preceding 12 months: 230. Single issue nearest to filing date: 300. Copies Not Distributed: 1) Office use, left-over, unaccounted, spoiled after printing: Average number of copies each issue during preceding 12 months: 600. Single issue nearest to filing date: 600. 2) Returns from News Agents: Average number of copies each issue during preceding 12 months: 117,515. Single issue nearest to filing date: 114,100. 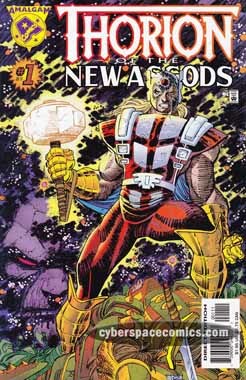 Peter B. Gillis is a comics writer that’s worked on the “weirder” Marvel titles like the Eternals, Doctor Strange, the Defenders and his own creation, Strikeforce Morituri. 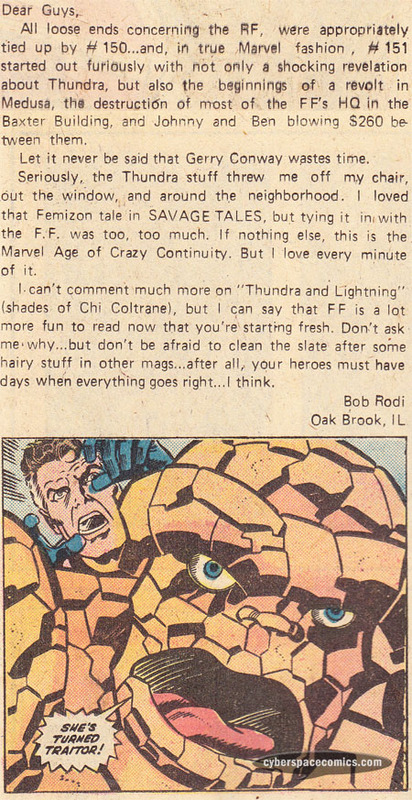 Ge got a letter printed in Fantastic Four #155 (cover date – February 1975), applauding Marvel’s embrace of the theory of multiple possible futures.